The status of University of Idaho senior quarterback Matt Linehan, who suffered a hand or wrist injury to his throwing arm late in the Vandals’ 24-21 loss to the University of Troy on Saturday, remains undecided as the Vandals head into a bye week. In a Sun Belt Conference coaches call Monday, Idaho coach Paul Petrino could not say definitively whether Linehan would play or whether he is out when Idaho hosts Coastal Carolina in its final home game Nov. 18. “The first thing we’ve got to see is if there is a chance to get Matt back,” Petrino said. If Linehan cannot play, sophomore Mason Petrino will start and Colton Richardson, a freshman from Lewiston, would be the backup, the coach said. 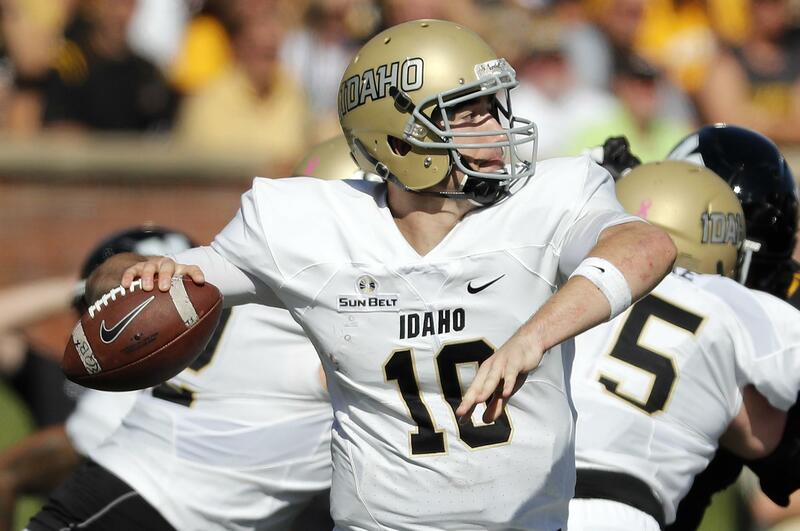 Mason Petrino came on in relief of Linehan in the final minute against Troy and threw a 6-yard touchdown pass to David Ungerer for Idaho’s final points. Petrino has played in six games as a quarterback or wide receiver. He has completed four of five passes for 64 yards and two touchdowns. Richardson has not played. Before he was hurt, Linehan completed 23 of 34 passes against Troy for 282 yards and two touchdowns. That moved him into second place all time in passing yards for the Vandals. With 10,772 career yards, he moved ahead of John Friesz (1986-89) who threw for 10,697 yards. Linehan trails only Doug Nussmeier (1990-93), who passed for 10,824 yards. For his senior season, Linehan has completed 173 of 281 passes for 2,056 yards, with 16 touchdowns and four interceptions. The Vandals are 3-6 this year with three games remaining. Published: Nov. 6, 2017, 7:42 p.m.